Our award winning Cumberland Sausage is the perfect partner for your bacon and eggs, with chips and a beer at the end of a busy day or as the ultimate barbeque banger. From steak pie to chicken pie and mince pie to breakfast pie we have them all. Freshly baked every day they are perfect for a snack on the go or for when you just need a quick wholesome supper. Sun, sea and short, sweet grass are the ingredients that make Anthorn Salt Marsh Lamb so special. Each spring hundreds of new lambs are given the freedom of a five-mile marsh bordering the Solway Estuary. W Lindsay and Son prides itself on supplying sustainably sourced high quality beef, lamb and pork from the local area, whenever possible. The majority of the beef and lamb comes from pastureland in and around the neighbouring village of Brigham where it is matured on the bone ensuring full tenderness and taste. The pork, a key ingredient in their award winning Cumberland sausage is generally sourced from farms in the Wigton and Bridgefoot areas. Visiting Lindsay's butchers in Cockermouth is a feast for the eyes, with an enticing array of meat and poultry through to scrumptious homemade pies carefully arranged in sparkling modern display units. 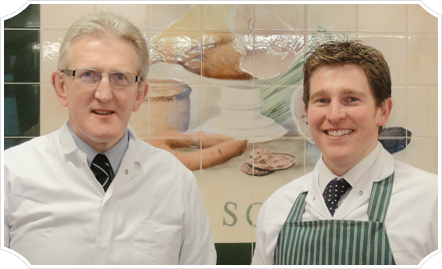 The choice can be overwhelming at first, but the smartly dressed master butchers are on hand to not only to serve waiting customers but also to offer advice on recipes and cooking times. Through the year’s customer trends, tastes and requirements have changed but in that time W Lindsay and Son have never compromised their standards in providing high quality meat and produce. Copyright © 2019 W.Linday & Sons. All Rights Reserved. Web Design Cumbria by Wombat Web Design.